Heavy Duty Self-Propelled Bariatric Wheelchair. This Days bariatric wheelchair is simple, practical, and offers excellent value for money. Constructed from a heavy gauge steel tubing for maximum strength and durability, the frame is reinforced with a double cross bar underneath. The upholstery is double-thickness for strength and comfort. The armrests are detachable and the swing-away footrests can also be removed entirely. The calf strap comes as standard, and a folding backrest or puncture proof tyres can be added as extras. 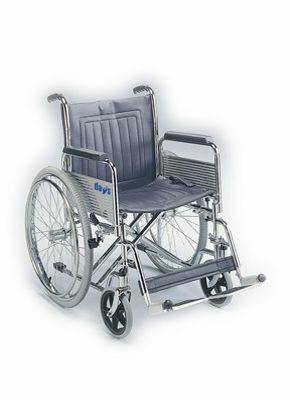 The wheelchair is available in two seat sizes, and is suitable for users up to 22 stone or 140kg in weight.